Prices listed below are per person based on two people traveling between June and September. All prices on this website are listed in Canadian dollars. For US travelers, US dollar prices are currently 20% less. Prices on some trips are less in April, May and October. Special events such as the Calgary Stampede affect pricing. 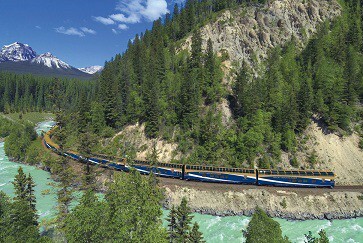 The following factors affect the price of your Rocky Mountaineer Vacation. Travel Dates: Economy fares are available in April, May and October. Full fares are available from late May through September. If you are traveling during the 2018 Calgary Stampede (July 6-15) and Calgary is part of your itinerary, expect to pay about $50-$150 more per person. You can see the difference between SilverLeaf & GoldLeaf Service here. Number of Passengers Traveling: Single travelers pay more per person than two people traveling together. Three passengers sharing a room will pay slightly less per person. Passenger Ages: Tickets for children between the ages of 0-11 are less than adult fares. Senior and adult fares are identical. Currency: Prices are listed in Canadian Dollars. Trips in US dollars are less. Call for current rates. Hotel Choices: Your hotel choices will help determine the price of your trip. If you choose a Rocky Mountaineer Vacation that includes one or more nights at Lake Louise, you will stay at the Fairmont Chateau Lake Louise. Call us if you have questions about prices or want to put together your own itinerary. We specialize in customer satisfaction and value: 1-800-913-9207 / 604-990-9299 or Email.